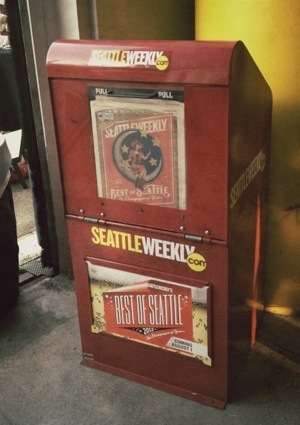 Best of Seattle Party Time! Let me make a disclaimer right now. I am by no means an event critic, a food expert, or even of any dramatic importance to the Seattle food scene, unless you count that I eat regularly and attempt to try new places every time. So take that with a grain of black Hawaiian sea salt before you continue reading this. 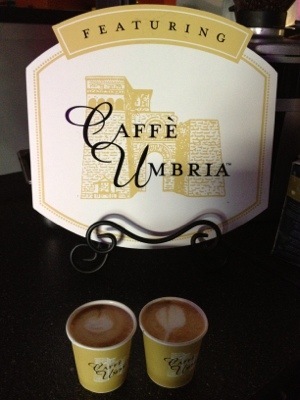 After attending the 2011 Voracious Tasting and Food Awards, I couldn’t help but want more. MORE MORE MORE!!! 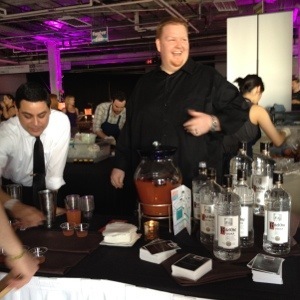 That was one of the best foodie events I have ever been to. 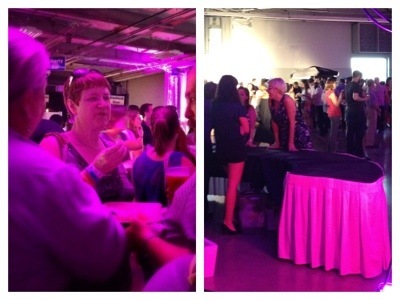 There was so much food and drink it was overwhelming, especially since we were rocking VIP passes. So I’ve had the Portland FEAST event on my radar since last year but when they announced the $600 price tag, I cried and whined really loudly about it. 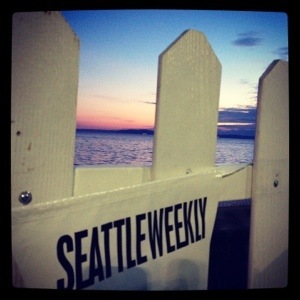 Luckily, Lia found discounted VIP tickets to the Seattle Weekly’s Best of Seattle Party. Finally! The afternoon started out magically. 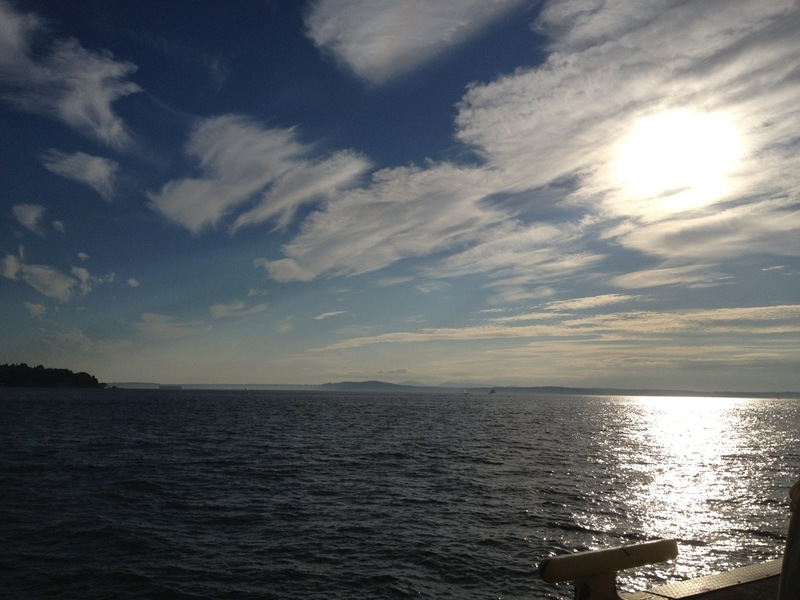 The sun was out, the skies were clear, and we had a FREE taxi ride through Uber, which by the way is freaking awesome. I highly suggest you try it! When we arrived downtown, it was mildly entertaining looking for a public restroom when a door guard suggested we try the Edgewater, a “hotel and restaurant that probably had a restroom.” Uhhhh, pretty sure we’re familiar with the Edgewater and there was no way we were going to wander in like bums trying to use their bathroom! Still trying to wrap my head around why they thought tourists from out of state might have been attending the Best of Seattle party. Round 1: Focus on the important things. Happy guy from Hunger in Fremont. Trophy Cupcakes. 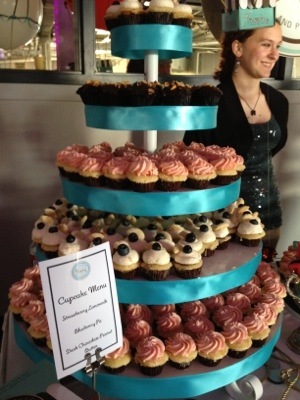 A staple at Seattle food events. 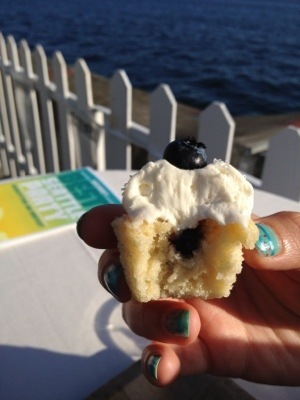 Lemon blueberry cupcake from Trophy. 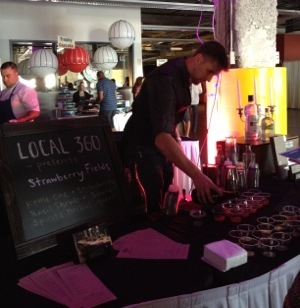 Local 360 serving up ‘Strawberry Fields’. 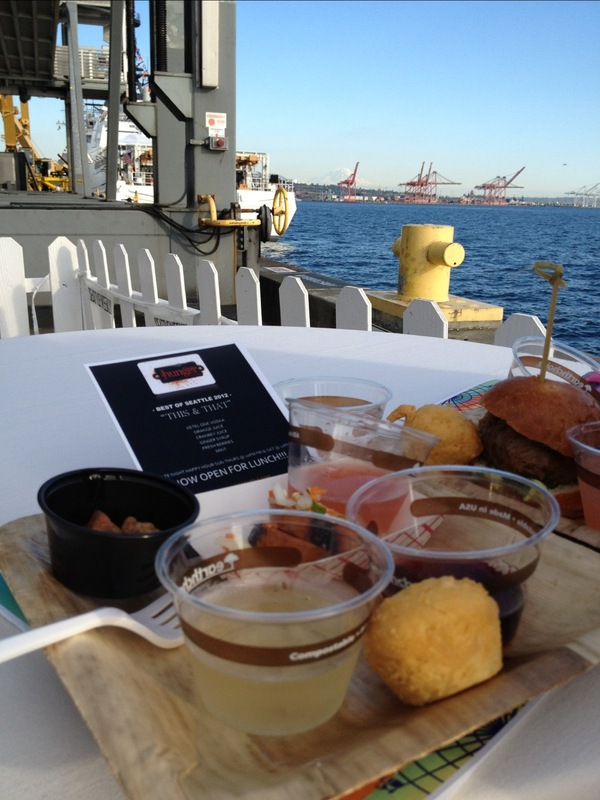 After the Voracious Tasting last year we learned to hunt down the food first, especially if you make it in early with VIP passes. Unfortunately this event wasn’t prepared for the VIPs. Lots of the food wasn’t ready when the doors opened, some stations weren’t even there yet, and some of the drinks weren’t chilled which meant they weren’t being served. I’m still a little sad that I never even got to taste the hard cider to compare it to our neighbor’s homebrew. 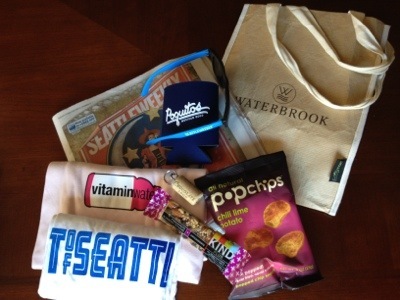 VIP goodie bag contents, sans DRY Soda that I drank. I did however make it into the VIP Lounge for the last VIP goodie bag and was seriously amazed at how angry people were to not get their bag. Seriously people, are you that mad that you missed out on a DRY Soda (which they were handing out anyways), some cheap sunglasses, and a cork keychain? Get a freaking life. All of us know the extra payment is really for the early entry! DUH! 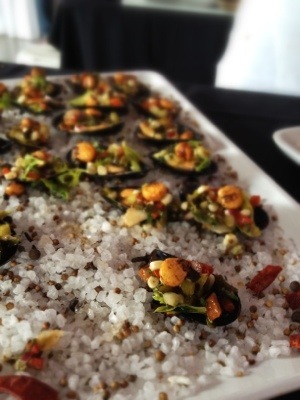 Mussel ceviche from Steelhead Diner. Round 2: More drinkage and fantastic view! 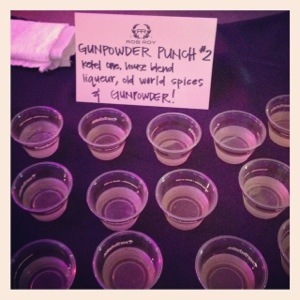 Gunpowder is apparently safe to drink? 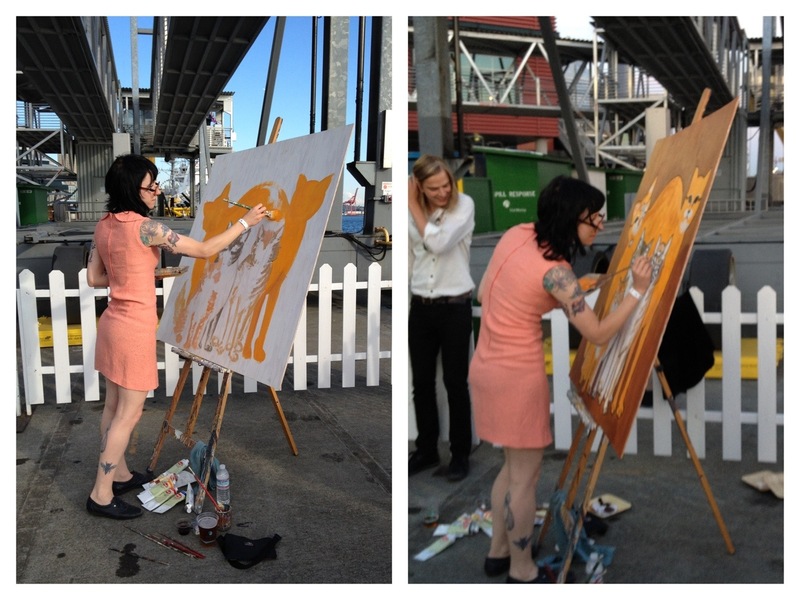 Margot Bird painting some crazy-eyed cats! 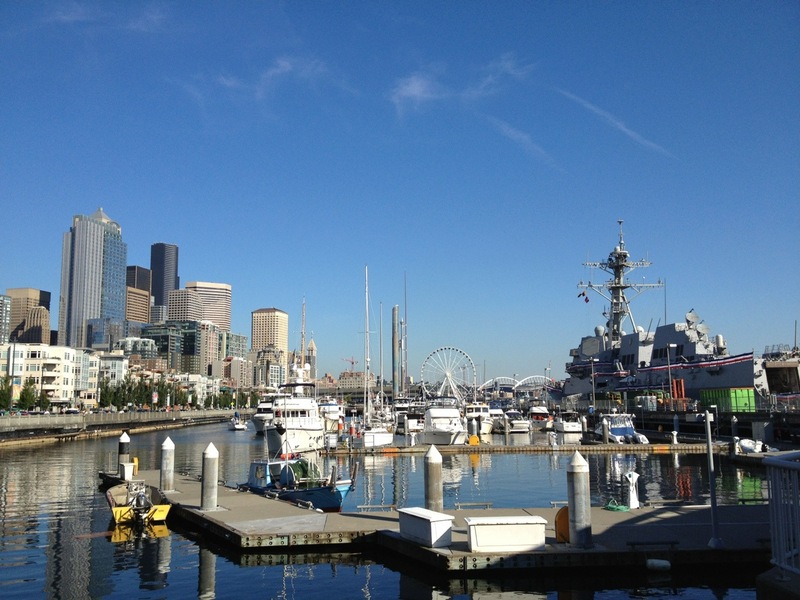 Seattle waterfront parties rule! Really. Between Lia and myself we have quite a few limitations on the things we can/do eat. I don’t eat a lot of meat, Lia doesn’t eat a lot of dairy… So after our second spin of the place during the VIP hours we gathered lots more drinks, a little snackage, and some delicious espresso macchiatos where the guy joked that I should post it to my LinkedIn. Doesn’t he know that LinkedIn is for career networking? Sheesh, the people at this place! 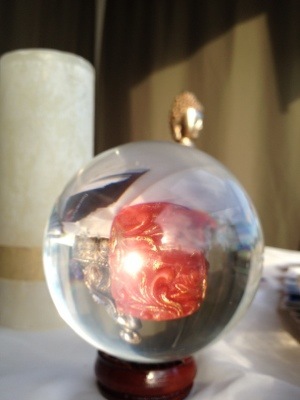 The Best of Seattle party also had a psychic there doing free palm readings! Super exciting, right?! We tried to get our palms read together but that was apparently a big no-no. So Lia went first and I sat in the waiting area building up massive anxiety. It was totally freaking me out and by the time I got in and out I was literally drenched in sweat. Even Lia noticed! Embarassing to the maxx! 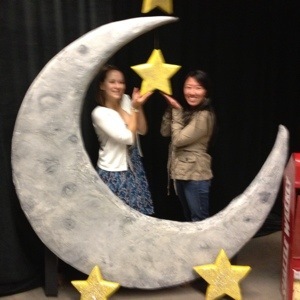 Fortunately we had some good entertainment inside after the stressful palm reading event. Teatro Zinzanni was there to perform and I got some video of the rope acrobat, who according to the lady next to me (my personal video commentator), had his fly down. Teatro Zinzanni has been on my bucket list for a while, so I should probably hurry up and cross it off before it either goes away or gets to be redonkulously over done. Birthday present, perhaps? 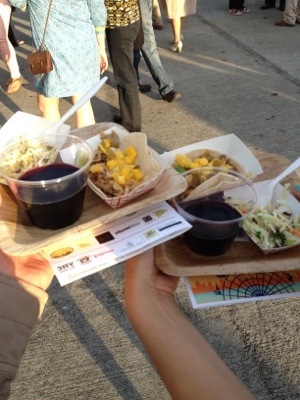 Round 3: Food truck tacos, jicama slaw, and WINE! 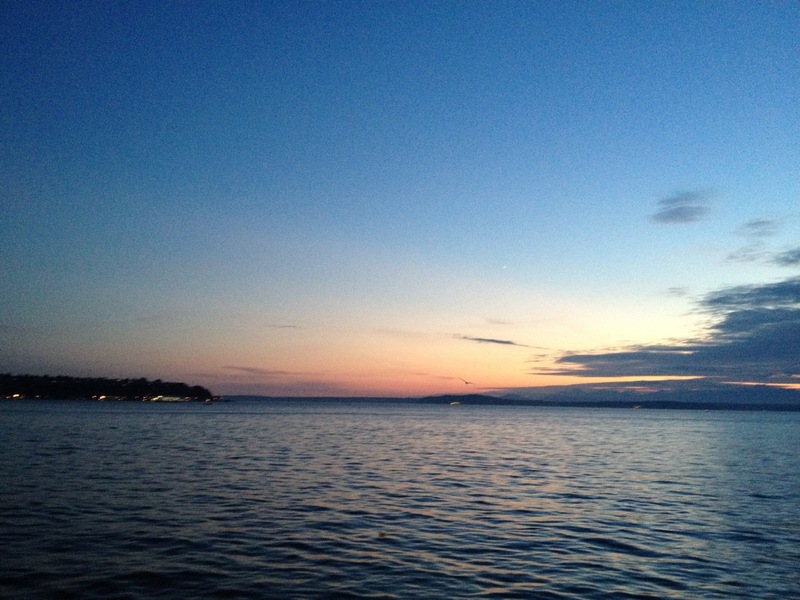 Beautiful sunset with a gorg friend! Eating the displays after food and drink were out. 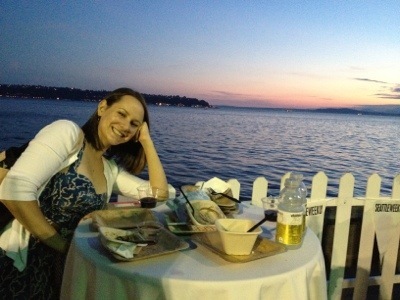 Seattle waterfront parties are the best! Oh wait, I already said that. 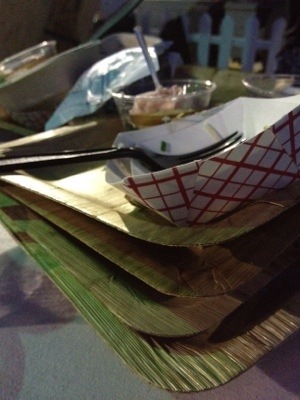 After standing in line for nearly 20 minutes for our final plates from the Fusion on the Run food truck, nearly everything was gone and it was 8:30. It was entertaining watching people eat some of the displays and grumble about the lack of food and drink. We made the best of it and enjoyed our last drinks and snacks outside in the perfectly amazing Seattle evening then decided to peace out. I felt super bad for the last band that was supposed to perform at 9:30, but what can you do? 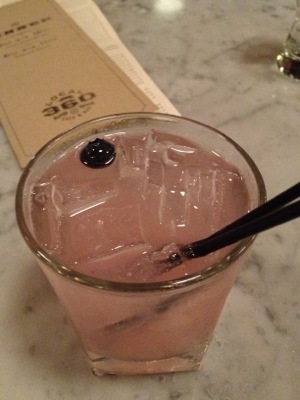 A booberry drink from Local 360 Seattle. 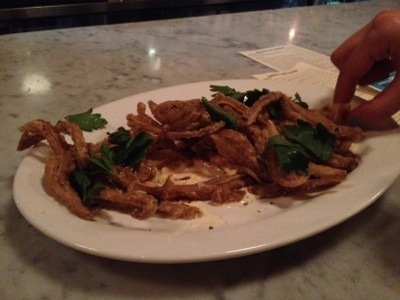 Fried pig ear from our bar neighbors at Local 360. Since our official foodie event closed out early, we unknowingly decided to shut down Local 360 Seattle by staying till every patron in the entire restaurant was gone. 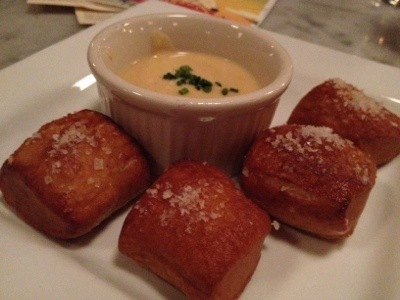 We met some nice visitors from Los Angeles at the bar, chatted with the new bartender (who was probably sick of us), and I got my weekly pretzel fix. I couldn’t have asked for a better close to an evening. Gorgeous full moon over Seattle. 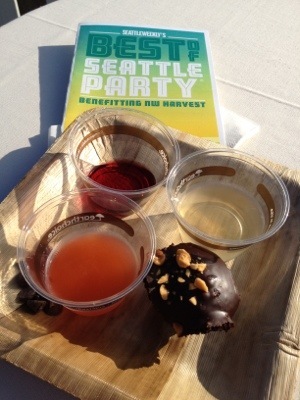 Even though the Best of Seattle party was a minor bust, I should still thank Seattle for yet another amazing evening. We got our VIP tickets at nearly 50% off, so I still consider it a worthy evening! Good food, good drinks, good peeps, and an amazing friend always make for a memorable night! 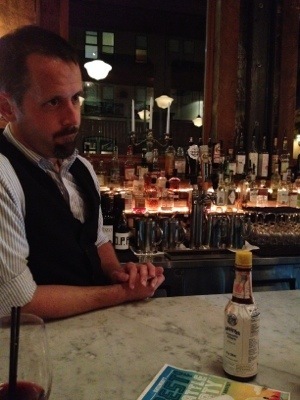 Favorite comment: “a drunk took this picture”.